As the 2016 Bassmaster Classic on northeastern Oklahoma's Grand Lake o' the Cherokees begins, the question in the minds of most media types and bass fishing fans across the nation is a simple one. Who will win the 46th edition of the Classic? 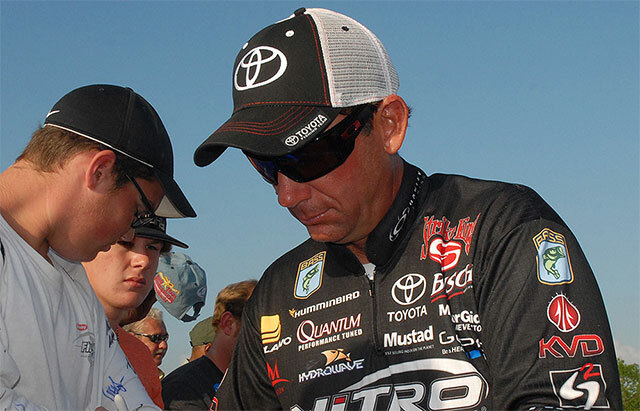 With that topic in mind, veteran Major League Fishing pro and Bassmaster Elite Series angler Mike McClelland of Bella Vista, Ark., was willing to talk about who might win this year's event. How about four-time Classic champ Kevin VanDam, an angler back in the mix after sitting out last year's Classic, the first time that KVD has missed a Classic derby since the early 1990s? "I think that this Classic plays into VanDam's hands way more than it did the last Classic at Grand," said McClelland. "Due to the fact that the fish should be much shallower," he said. "It should allow Kevin to cover the amount of water that he wants to cover and to pick off the aggressive fish." If VanDam isn't the one hoisting the Classic trophy at the end of the 2016 event – which would be a record fifth title for him – will it be a local angler like two-time Major League Fishing champ and veteran B.A.S.S. pro Edwin Evers of nearby Talala, Okla.? "It depends on how you look at it," said McClelland. "Everybody tries to put me as a local on Grand. The biggest thing about me and Grand is that it's a lake that I've fished a fair amount over the years, I've had a lot of success there and I fish the lake with confidence. "But it isn't a lake that I fish all of the time." And Evers, a pro tabbed by many as the favorite to win the 2016 Classic? "Edwin fishes the lake probably more so than I do, but I think the fact that he is as seasoned as he is, that (the local factor) shouldn't be a curse for him this year, other than the boat traffic and the people that potentially could follow him," said McClelland. "There's probably nothing worse than trying to run a pattern, especially at the Classic, and having 30 or 40 boats chasing you around," he added. "That would be the (local) curse more so than anything in my mind, for a local (pro) like Edwin or Jason Christie." So does that mean that this year's winner will not be one of the sport's rock-stars, anglers who are sure to be traveling about Grand with plenty of onlookers following closely behind? "I think that there's a very good possibility (for that to be true)," said McClelland. If this year's Classic winner isn't a VanDam, an Evers or a Christie, then who might it be? "I think there are some anglers fishing in this year's Classic who are real dark horses (to win this event," said McClelland. One is a name familiar to Major League Fishing fans. "James Watson is a guy that has a lot of experience, probably as much if not more experience on Grand Lake than I do," said McClelland. "He's going to be one of those guys that is somewhat overlooked." Especially since Watson isn't a regular on the Bassmaster Elite Series tour (he's a Major League Fishing and FLW Tour veteran) and is an angler who is fishing in his very first Bassmaster Classic (after having qualified for the event by winning a B.A.S.S. Open event last year). "I don't think he'll have a lot of crowds following him (around), and that could play right into a guy like James Watson's hands," said McClelland. Mind you, the fact that Watson might not have the crush of spectator boats around him that other anglers might have doesn't mean that he isn't a serious contender to be in the hunt for the 2016 Classic crown come Sunday. "(A lot of us) know James from Major League Fishing and James is James," said McClelland. "He's not going to let the fact that he's fishing (in) his first Classic be a huge deterrent. "James will fish just like he does every (other) day. If he can put together (a pattern) that works, he's going to be successful and do well in this Classic." That being said, McClelland does point out that having some past Classic experience certainly doesn't hurt an angler's chances to win either. Especially in terms of knowing how to deal with the pressure cooker schedule, the swarm of media and fan attention, the spectator boat traffic on the water, and how to get into position to ultimately win fishing's biggest prize. "It is a big deal," said McClelland, who has 11 Classic appearances under his belt. "I will have to say that the first two or three Classics that I fished, there was no way that I was going to win just due to the fact (of) not knowing how to handle the pressure and everything." So why is McClelland putting an angler like Watson on his dark horse list of potential champions? "The past few years, B.A.S.S. has really allowed us a little bit more freedom during the Classic," he said. "We don't have near the meetings and all of the media stuff (that we used to have). "We can actually stay where we prefer to stay and guys can fish the Classic a lot freer now than they could a few years back." Meaning that in the end, while there are certainly a few obvious favorites at the top of everybody's list, the truth of this year's Classic is this: that it's a wide open race and any number of anglers have a chance to win. In a derby that end up being a Grand Lake classic in more ways than one.